Lawn Treatments and cats. Is this kitten safe? Do we ask this question enough? Photo in public domain. Something needs to be said about lawn treatments and cats. Of course, you can add dogs, children and adults. It seems to me that too many people have an obsession about creating a perfect lawn and they don’t mind how they achieve it. They want to get rid of weeds and insects. Weeds are wild plants which some people think spoil the appearance of a lawn but weeds are still plants. And there are many lawn treatments which kill weeds. Most of these contain some pretty nasty chemicals which pose a health threat to the entire family. The sort of chemicals involved are organophosphates, carbamates, phenoxy and benzoic acid herbicides, MCPA, pyrethroids and organochlorines. These chemicals are poisonous to a wide range of living organisms. 19 of the 30 most commonly used lawn pesticides are linked to cancer. 13 are linked to birth defects, 21 with reproductive effects and so on and so forth. They are ghastly chemicals. 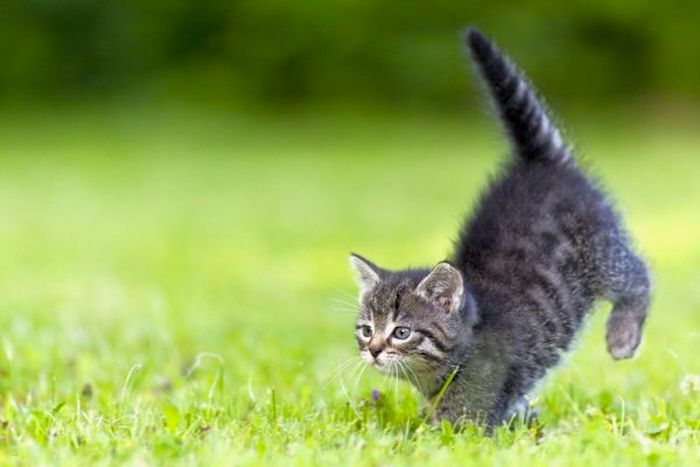 Cats are clearly particularly vulnerable as they are nearer the ground, lie on the ground and in the grass, eat grass, self-groom and ingest the chemicals and so on. People bring the chemicals inside the home on their shoes where they are also dangerous to cats. When you read the instructions on the packets/tins of these lawn treatments it says that you have to make sure you water in the treatment until the lawn is dry. The manufacturers admit by implication that they are poisonous to pets. However, the best advice is that these lawn chemicals are still unsafe when dry. Many of these chemicals remain active for a month to over a year during which they released toxic vapours. Breathing these vapours can cause illness. So our obsession with the perfect lawn is often dangerous to cats, my particular concern. When I lived in a block of flats I remember one of the leaseholders keeping the lawn in good condition by using lawn treatments. I mentioned to her that it was dangerous to my cat. She had clearly ignored the possibility. It hadn’t occurred to her. I’m not saying she was a bad person I’m just saying that the welfare of cats with respect to lawn treatments is something which rarely enters the minds of a lot of people. There are alternatives to toxic lawn care chemicals such as corn gluten. This is a natural weedkiller and fertiliser. Lawns can be improved by thin spreading of compost in the spring and fall. Epsom salts are much safer and benefit lawns. And there are natural lawn care practices which people can research on the Internet. I think it’s generally agreed today that too many chemicals are sprayed onto the landscape and I’m also referring to farming as well. These chemicals can make their way into rivers and the sea causing damage to wildlife; to our planet which sustains us and our animal companions. In America, the US Centre for Disease Control and Prevention (CDC) found that pesticides were present in the blood and urine in every one of over 9000 people that they tested nationwide. They concluded that the average American carried 13 of 23 pesticides inside them1. Astonished? I’m sure the same applies to many Western countries. People need to do more to find alternatives to these chemicals and it would be nice if we accepted the odd weed, they are plants after all. Writing about lawn treatments brings to mind carpets, strangely enough. You might know that carpets are impregnated with chemicals which are dangerous to cats. Furniture is also impregnated with chemicals as fire retardants. Is it any surprise that cats can suffer from strange and mysterious illnesses about which veterinarian scratch their heads such as feline hyperesthesia (this is a random example). There are many idiopathic feline diseases; diseases with unknown causes. I’m not saying this condition is caused by chemicals in the environment but it might be and we can do better in thinking of the welfare of our cat and less about the appearance of our lawns and homes. 1. learn.eartheasy.com (and for other information on law care on this page. This entry was posted in poison and tagged cat poison, chemicals poisonous to cats, dangers to cats, lawns, poison, toxic to cats by Michael Broad. Bookmark the permalink. Yeah, as time passed and one cat of mine after another developed cancer I looked to these things that could be causing it. The vets had only said that they too see a lot of cancer in cats, implying that whatever causes it, it’s just something we need to deal with. Over the years I have seen some better thinking on what we can do to better their lives, like better nutrition and to be mindful of all the chemicals we’re exposed to, indoor and outdoor. We can do something about some of them. I do look for pet friendly, as in flea treatment (food grade diatomaceous earth) and I put plant food in the soil, not just spray stuff all over. And I took out all my carpeting, threw out my fabric furniture, stuff like that. Well said Albert. I consider these to be hidden hazards. Most cat owners are unaware of them. And I don’t see enough being done by vets to highlight these dangers and manufacturers in taking steps to find alternative ways to make treatments safer. It is not good enough.